Afterward the data has been synthesized, a plan for the product is developed. This includes determining how the user will interact with the product at each phase of their task flow, what steps they will need to go through to accomplish each tasks, and how the product will communicate accomplishment, validation or errors. "Expanding Impact for Social Good"
Introducing a way for users to send money via their app to causes they care about , while meeting the needs of both online donors and existing users. "Almost 40% Increase in Completed Auto Loan Applications"
Enhancing an existing online application to reduce abandoned applications, ensure that its mobile optimized and designing the first phase of the vehicle shopping experience. "Make It Clear, Fast & Easy"
Creating a simple and user friendly browser-based product for the feature rich POS system, while shortening the learning curve for new customers. "Guided Process for Efficient Case Processing and Compliance"
Replacing an outdated component content management system with a more agile platform to enable a more efficient Appeals & Grievances process. 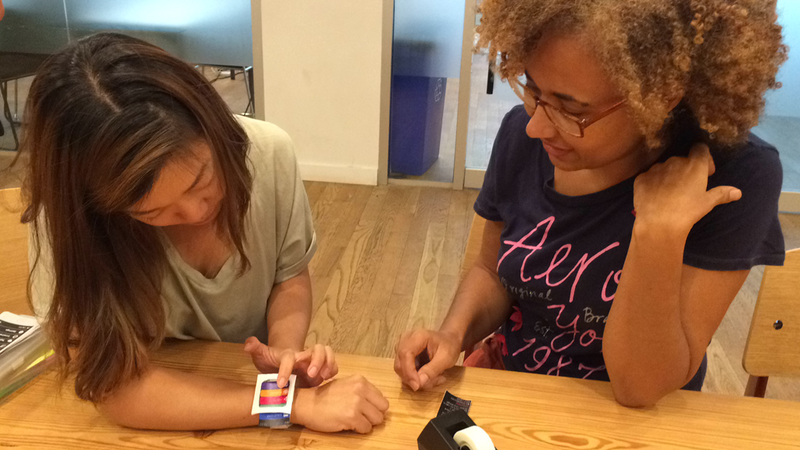 "Combining Gaming, Social Interaction & Physical Fitness"
Integrating game-like features for an Apple Watch app is an opportunity to motivating users with themes based on Nintendo characters. The path that a user follows to complete a task within the interface. It includes the amount of pages, clicks, actions and descision points that a user encounters during the process of completitng their task. The Auto Loan process was designed to allow the user to follow various paths, depending on their loan needs. The user flow was the first step in insuring that the flow of the application covered the various user needs. The flow had to allow for shopping for a new or a used vehicle, allow for making the purchase from a dealership or a private party, and the option for applying for a loan, refinancing or buying out a lease. 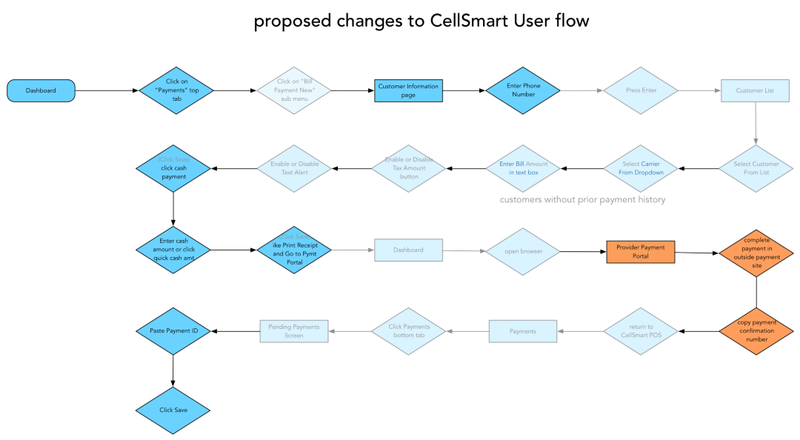 The bill payment workflow was streamlined to decrease the process by 8–10 clicks / actions (depending on whether the user was already in the system or not), and by 4 pages / pop-ups. 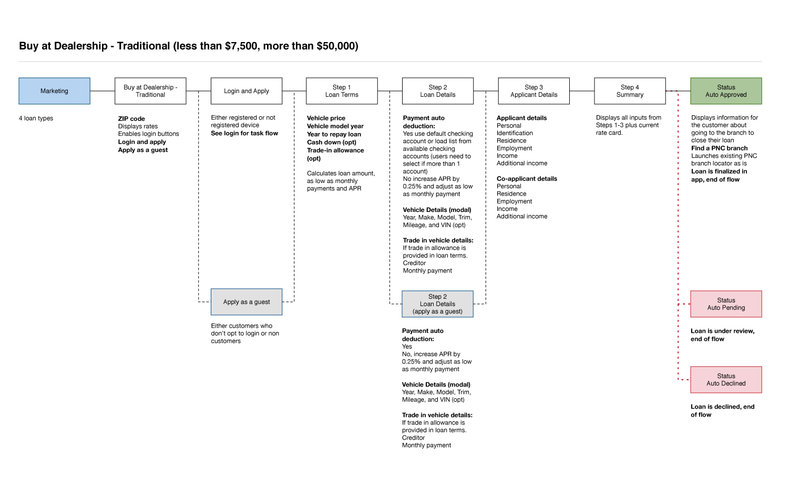 The light blue actions and pages indicate steps that were combined or eliminated in the process. A visual blueprint of how the product is organizated. It included the amount of sections and how different sections are related to the home page and to each other. It is a way of measuring whether there are too many sections (which may overwhelm the user); or too few (which may lump too much together, making it hard for users to find what they're looking for). The application process was linear once the user choose the loan terms. The task flow acted as the site map, outlining how the user could select their loan type, whether they would purchase a new or used vehicle, and the type of lender. As part of the design recommendations, the navigational information architecture was to condense and simplify. 10 primary navigation categories were reduced to 9, and 42 sub categorieswere reduced to 23. A flowchart-like way of demonstrating interactions such as entry & exit points, user initiated actions, alternative paths, and decision points. 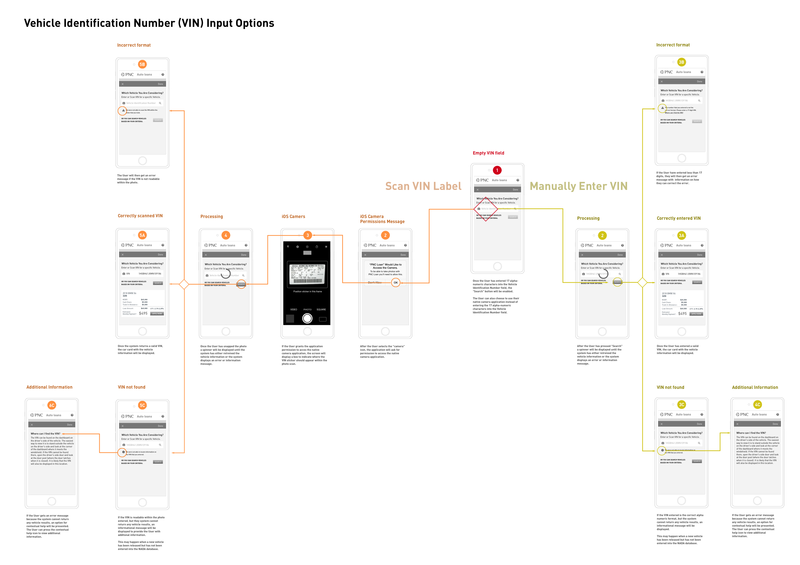 Wire flows are particularly helpful when designing for mobile products. However, wire flows can also be used when designing for desktop products. Instead of showing the full mobile screen design, the specific section of the desktop screen where the interaction is taking place is shown. In wire flows and arrows connects the UI elements where the user initiates an action to the next step in the process or an example of feedback from the product as a result of that interaction. Wire Flows were developed to document the process that a user would go through to complete a common task within the mobile product. 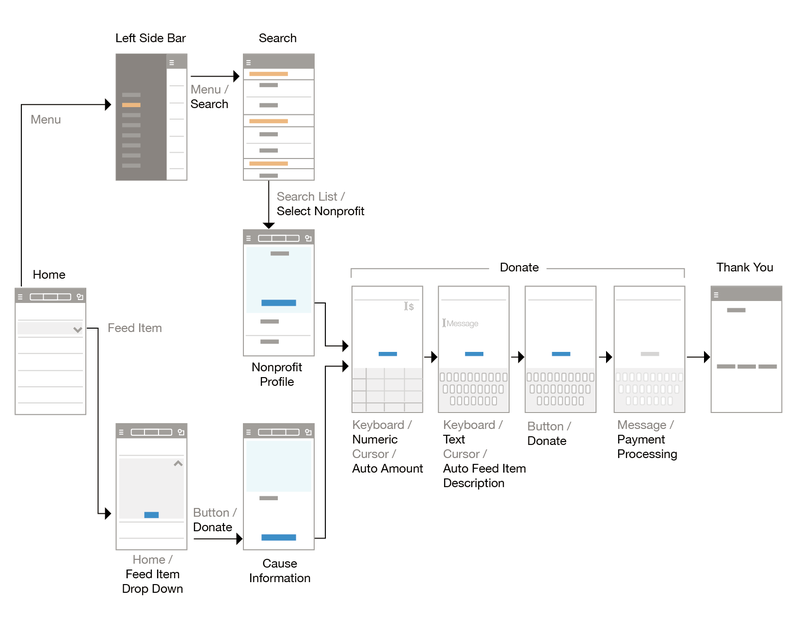 A task flow was plotted out visually in an app map to get an overview of how users can transfer funds to an organization. 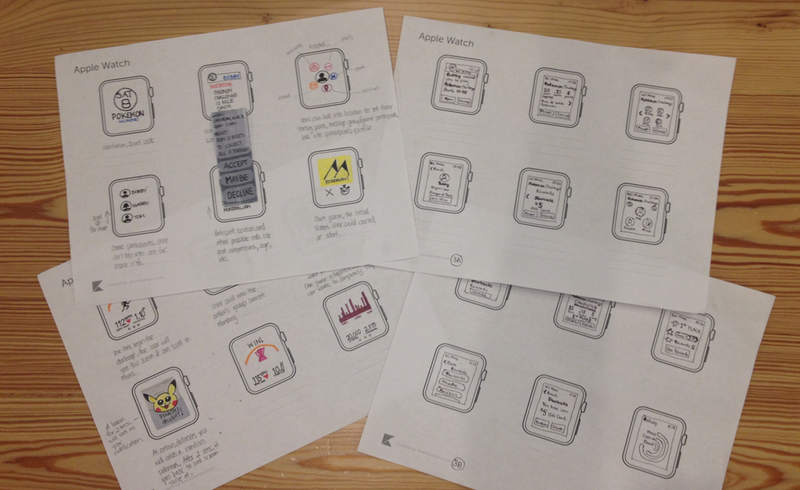 Rough drawings to illustrate the basic jist of how the product might be laid out. Depending on what point in the project they are employed, they could be basic line drawings for placement and visual heirachy or they can be more flushed out to include branding and visual elements. The user interface was developed starting with sketches, moving to low-fidelity wireframes before finalizing the color mockups. The screens were sketched out to design solutions that woiuld worked with the limited real-estate of the Apple Watch screen. Identifies potential stumbling blocks or problems user might encounter when using your product. It invloves observing a user performs a given tasks, and observing how easily and efficiently they accomplish (or fail to accomplish) the task. Initial screens were sketch out and took the solutions. Based on conducted usability tests on low and medium fidelity paper prototypes. Basically learning from your mistakes. After each version, evaluating whether the solution met business goals, met user needs, aligned with heuristic or interface guidelines and remained viable with the technical environment. Guidelines specified that the provider was the only party that could update their preferred contact information, however providers did not always update their profiles in a timely manner. 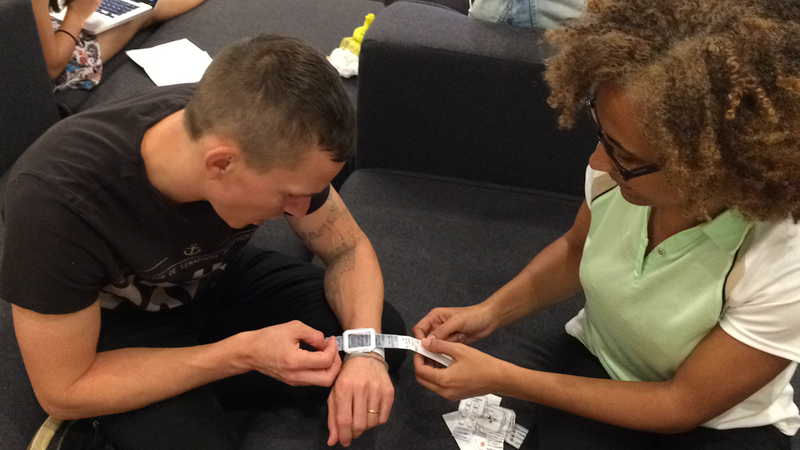 During preliminary usability testing, it was found that users often had to look up the contact information externally. An enhancement that was proposed was to allow users to add their own notes to the providers contact information with the provider profile. If one user found that a phone number was out of service and tracked done the new number, they could leave it in the notes so that the next user would not need to repeat the same task. View Full Recommendations Report to see all of the proposed enhancements. User did not see the calls to action for printing the receipt when they were placed under the receipt. They were looking for the calls to action in their activity area in the center of the page. Users did find the space to enter the confirmation number. More visual emphasis was placed on the call to action and the title of the field was changed to include multiple verbiage used on multiple external carrier payment portals. 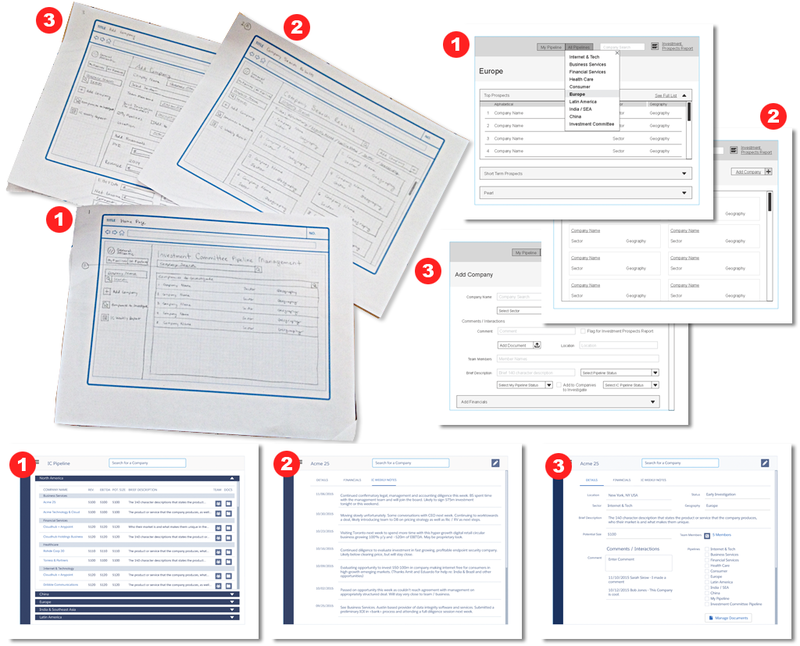 View additional details on what changes were made between the initial low-fidelity wireframes and the final version.